An unexpected moist, custard-like center in this yummy cornbread sets it apart from the classic dry cornbread. The final addition of a cup of whole milk sinks into the cornbread to create that soft center. It will surprise and delight your family and friends! 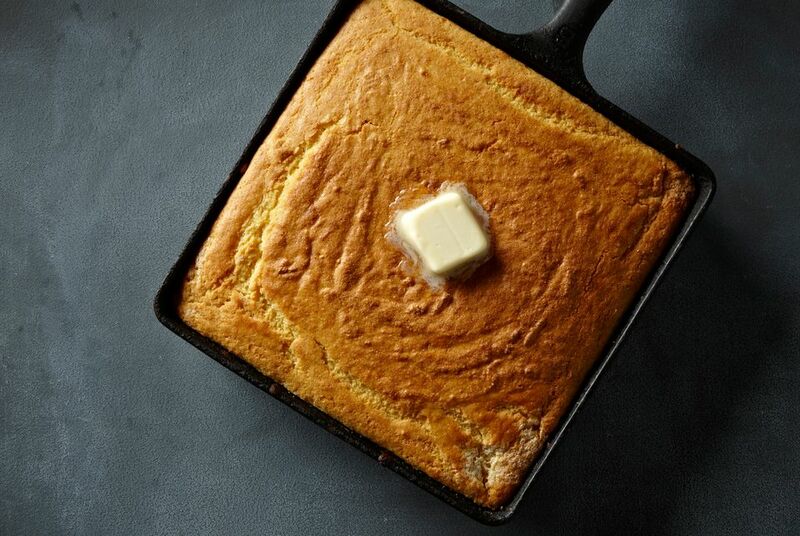 Because this is a Southern cornbread, there's no sugar in it. Feel free to add 2 tablespoons of granulated or brown sugar for a slightly sweet cornbread. Or add a tablespoon or two of honey. There are many ways to jazz it up. Add about 1/2 to 1 cup of shredded cheese or about 1/4 cup of chopped green onions. Turn up the heat a bit with a few tablespoons of jalapeno peppers, or add some crumbled cooked bacon or finely diced ham. For complementary flavor and texture, add 1 cup of corn kernels to the batter. If you have bacon drippings, by all means, add them to the pan instead of butter. The smoky, saltiness of the bacon gives the crust extra flavor. Serve the cornbread with any meal that you would serve classic cornbread. It's excellent with all kinds of beans or Southern-style greens, or serve it with a big bowl of chili. Put the butter in a 9-inch cast-iron skillet or 9-inch square baking pan. Place the skillet or pan in the oven or on the stovetop until it is hot and the butter has melted but not browned. Alternatively, use vegetable shortening, lard, or bacon drippings in the pan. Meanwhile, combine the flour, cornmeal, baking soda, baking powder, and salt in a mixing bowl. Stir with a spoon or whisk until thoroughly blended. In another bowl, whisk the eggs with the buttermilk and 1 cup of the whole milk. Set the remaining 1 cup of milk aside. Add the egg and buttermilk mixture to the dry ingredients and stir until well blended. Immediately pour the batter into the hot pan. Carefully pour the remaining 1 cup whole milk evenly over the top of the batter; do not stir. Place the pan in the oven and bake for about 45 to 50 minutes, or until cornbread is set and baked through. The Cornmeal: Stone-Ground or Steel-Ground? Unless cornmeal is labeled "stone-ground," it is likely steel-ground. If it is steel-ground, the husk and most of the germ have been removed in the process. Stone-ground—or water-ground—cornmeal includes the hull and germ of the grain. You can find stone-ground cornmeal in the natural or organic section of the supermarket, or you can order it from online sources. Because it contains the germ, stone-ground cornmeal should be stored in an airtight container in the refrigerator.